As MC, Chiquita Searle is a vibrant and charming facilitator who is able to maintain audience engagement from start to finish. She is positive, energetic and upbeat; adept at setting the appropriate tone for the event, maintaining tight time schedules and ensuring smooth transitions between segments. 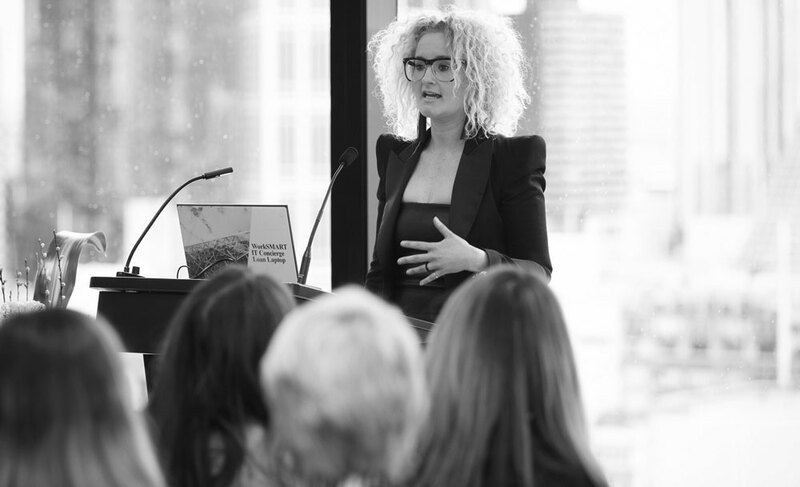 She has MC’ed and facilitated panels across a variety of events for clients including the League of Extraordinary Women, Run the World, Empowered Women in Real Estate, Australian Women of Medicine and Pause Fest. Sharp, witty and engaging. As the emcee, Chiquita, was able to capture an audience of 450+ for our whole day Run the World Female Entrepreneur Conference and keep the energy levels high. Chiquita Searle; the girl with flair and even more hair! Chiquita coordinated and facilitated our ‘Top Women in Tech’ panel for Pause Fest 2016 and did a stellar job. As a facilitator she is engaging, full of character and able to hold the attention of the audience while keeping the panel on track. A great addition to our lineup in 2016! While at Pause Fest I also observed the panel discussion that Chiquita ran and it was first class. She made the panel really think and asked unusual, thought-provoking questions that held the audience’s attention. I would happily recommend Chiquita to speak at future events, corporate gatherings and seminars and/or workshops. I would have to say Chiquita Searle helped make our Empowered Women in Real Estate event so much fun. She has a way about her that engages everyone. Her willingness to go the extra mile, understand your audience and the line up of speakers is excellent. A truly professional and fantastic MC. When a presenter puts in the effort before a presentation, that means you, the audience, are highly valued. Chiquita ‘s presentations are well planned, well researched and well written. Her passion and energy for all things dynamic + female + entrepreneurial, means you’re certain to experience a session where there is more than ‘food for thought. A good MC is vital to the success of any event. It’s the role which holds the event together, maintains energy, controls the time and ensures a positive outcome. Chiquita has experience with full and half day conferences, panel discussions, facilitation and interviews. To confirm Chiquita’s availability for your upcoming event, please complete this form and she will be in touch asap.